Woohoo….kitties! 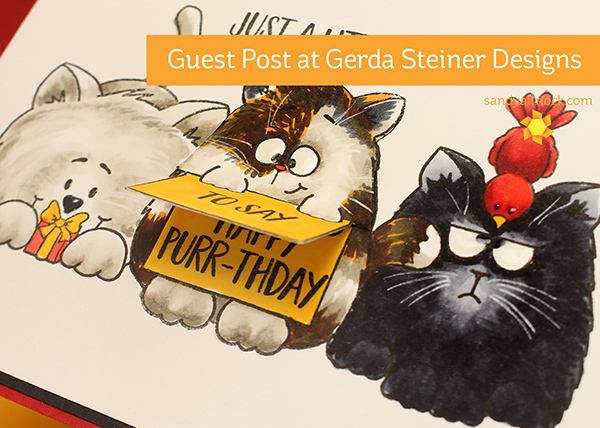 Go visit the Gerda Steiner blog for today’s post and video! OMG! This is so cute! Love the stamps and the colouring. Hugs. I love these stamps & I went to the website & went crazy. I bought everything, almost! They have a 20% off sale right now so I saved a bunch with all I bought. Oh my goodness that is just totally way too cute!!! What a cute card. I’m a dog person but I have to say these kitties are adorable. I have always struggled to paint black cats and I got a few ideas from viewing your picture here. Any chance you might do a quick little watercolor tutorial for a black cat? I desperately want to paint my Alex and no matter what I do, all features are lost in his blackness. The link doesn’t work and when I went to her blog via SEARCH that video is not there. We had some time mixup. Link works now! The link to Gerda Steiners blog does not work and your post is not on her blog 🙁 Too early? Links to video aren’t working.